It came over my home and was very loud. After hunting for my camera I dashed outside to catch it as it flew away. 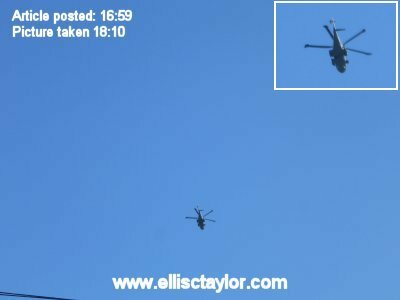 I’ve written before on how I seem to attract helicopters, military specifically. I’m not talking about quite close, I’m talking directly overhead, on occasions hovering for quite some time overhead. It concerns the neighbours. Perhaps it’s just a coincidence?…Yeah, that’ll be it. I suspect it is only the first dark reaction to that article. This entry was posted in Crime, Demons, Ellis Taylor and tagged helicopters, james casbolt. Bookmark the permalink.